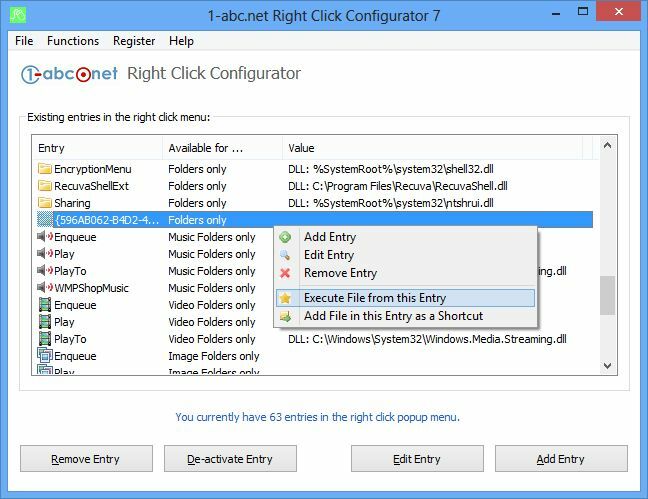 1-abc.net Right Click Configurator - Decide what the Windows Explorer popup menu does! When you use Windows Explorer for opening, deleting, moving or copying files (e.g. by executing it through the “My Computer” icon on your desktop) a popup menu is opened by clicking the right mouse button on any entry that allows you to get access to many different programs and features. If your last Windows installation was a long time ago and you installed and un-installed several products on it since then, you probably recognized that sometimes you have much more right click entries and features as you really wish and need. 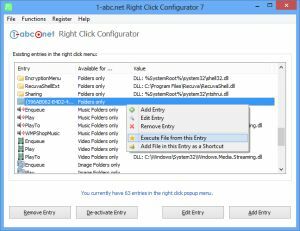 In the worst case, this right click menu does not work anymore, because there are still software tools and utilities that keep these entries alive even if the program was removed from your system long ago. Configuring these entries can now be done easily with 1-abc.net Right Click Configurator! From a very easy-to-use interface you can see all these connections to Windows features and external programs. De-activating such an entry is just one click, and activating it again is only one click as well. You can also modify or remove it completely, which should be done with highest caution of course. But that is not all: Add your personal right click entries by entering a name for it and selecting the path to an executable file you want to start from it, add any customized command line that Windows would also understand in the “Start”-“Run” dialog or take one of the default features that are already available on your system but can normally not be started from the right click menu. With 1-abc.net Right Click Configurator the Windows Explorer popup menu will not be a mystical secret for you anymore!